Second article in our February landing page series. After recalling the definition of these landing pages, let’s see why you should work seriously on your landing pages today. Launching a marketing campaign without a specific landing page will automatically lose you money. Why? The best example comes from AdWords. On AdWords, your quality score is a very important variable that strongly influences your average rank and therefore your expenses. In fact, your average rank is calculated based on two main variables: Your quality score and your bid. So if the first is low, the second has to compensate. 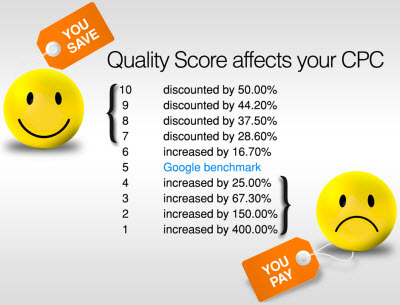 For example, a quality score of 4 would lead to an average 25% increase in CPC. How can you bring it up? Well, generally, your quality score depends on three main factors: Your ads, your keywords and… Your landing pages! To increase it, you therefore need to optimize these three factors, including your landing page, and not just concentrate solely on the things that can be optimized from the AdWords platform. If we wanted to really boil it down, we could say that: Non-optimization of landing pages = non-optimal quality score = higher CPC (than it could have been) = lost money = bad news. To learn more about the relationship between a landing page, quality score and savings, read this article by Simon, who already covered the topic… In 2009! And for more detail about the factors that make up a quality score, this Wordstream article has a good overview. Now you’re convinced that you NEED a landing page for your AdWords campaigns. That’s great. But watch out, it needs to be a dedicated landing page. Why? Left: the wireframe is based on the Virgin Mobile USA homepage and it has 57 links. 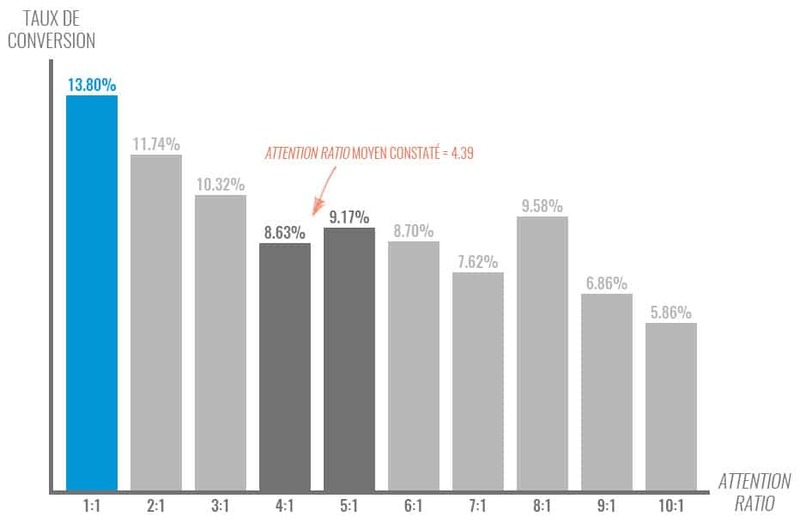 If the campaign you’re promoting is “Promo 2” (highlighted in red) then not only will it be hard to find midst all the clutter (the Attention Ratio is 57:1), there are so many competing elements that your prospect will either hit the back button or click on another of your promos. Both of which results in a failed campaign. What’s wrong with them clicking another promo? Surely a sale is a sale. NO. If they don’t interact with the campaign you’re promoting, your AdWords statistics will reflect a failure as “Promo 2” wasn’t the one that converted. Right: Take a look at the landing page below. It’s very clear that there is only one thing to do here, so the Attention Ratio is a perfect 1:1 and the purpose of the page is much clearer. What happens when you promise something to a child and don’t deliver? They hold it against you forever (or at least until you give them a big bag of candy). Same holds true for your users. If you promise something in your ads and calls to action, the worst, most disappointing thing you can do is fail to follow through. What do I mean by that? Here’s an example: Say I’m looking for quotes for car insurance. I do a search on Google and find a promising ad from Desjardins. I’m told it will be “fast,” that I’ll get a discount, and that they have 95% customer satisfaction. I click. A quick calculation of Attention Ratio delivers a result of 56:1. That means there are 56 different things I could do on the page. Quite the dilemma. The conclusion is clear: This page is neither dedicated, nor specific. A little much for a “Quick submission,” no? However, paradoxical as it may be, this comes a lot closer to the ideal landing page than the one I landed on. First off, the Attention Ratio is perfect (1:1 with the exception of legal copy and phone numbers), and it’s a more consistent experience – the title mentions “Quick submission,” which is a definite point in its favour. All that’s missing is a little extra copy about the discount, the level of customer satisfaction, and the advantages of choosing Desjardins, and it would have been a done deal. And eventually, using a shorter form would increate conversion rates. Note: This is just one example among dozens I found after a few minutes of searching. Sorry Desjardins, you just happened to be a perfect example. 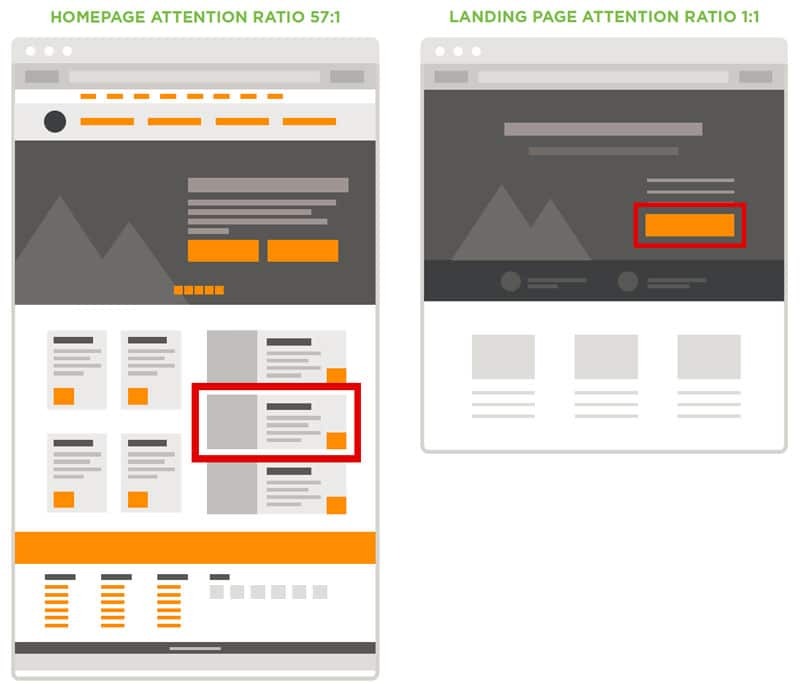 To summarize, consistency is measured by a landing page’s ability to reflect the call to action the user clicked on. So the landing page should contain the same text and even the same visual as the ad: It needs to deliver on the promise that was made. Creating a consistent experience is easy. Yes, easy. Assuming you’re using a dedicated, specific landing page for each objective (for each ad group in AdWords, for example). On the other hand, it’s very hard to create a consistent experience between the ad and the landing page when the latter is a page on your website. Why? Because your website, especially your homepage, is devoted to communicating your USP (Unique Selling Proposition), while your landing pages are designed to communicate UCPs (Unique Campaign Propositions). Big difference. Your company only has one USP, but it can have as many UCPs as you have campaigns. Driving people to your homepage is therefore not appropriate because you can’t change your headline and content to reflect all your UCPs (it would end up being too vague, and have a major impact on your USP). That’s why it’s so important to have a dedicated landing page for each of your campaigns. For each stage, the user has different needs: If you serve up the same content to all users, or put all your content on a single page, you can be sure it won’t work for most of them. Creating multiple landing pages for your content and the different stages allows you, first of all, to more precisely measure conversion rates throughout the funnel, and to identify content that performs well, and content that needs to be reworked. And if you pair these lading pages with a CRM or marketing automation tool, you will be able to identify and follow users throughout their journey. And then you’ll be able to completely personalize their experience. By placing tracking pixels on all your landing pages, you can find out what your users are doing, how interested they are, and then put actions in place based on this data. And these actions can be automated. Determined to keep my New Year’s resolution, I get online to search for a new sport to start this winter. I Google ideas for cardio activities. The AdvisoFitness sport centre, keeping the buyer’s journey in mind, came up with tons of content around cardio activities and is hyper-present in my search results. It’s a great way to learn more about all this! From the first time I visit their blog, I’m “pixelized” by their marketing automation tool, which registers me in its prospect base. It doesn’t know anything about me, but it knows I exist. But not yet. For the time being, I read. And after a few days, I decide to try out Crossfit. It seems to be all the rage. So, I go back to Google and, because I don’t want to make a bad decision, I type in “best crossfit course in montreal,” looking for advice. Huh – it looks like, in addition to writing articles, AdvisoFitness is also running an AdWords campaign. There they are, in first place in my search results, enticing me with an ad titled “Best Crossfit course in Mtl according to members.” This peaks my curiosity, so I click… On the landing page, I’m able to download a comparison of the primary courses offered in Montreal, as evaluated by three independent bloggers. I don’t need to provide anything in exchange, so I download it. In the background, the marketing automation tool is registering all this behaviour and my score starts to go up: I become an interesting prospect, and fall into the “crossfit-hot” segment of the tool. Now’s the time for them to unleash the third stage of their arsenal: Email. The next day, I receive an email inviting me to a free Crossfit course. The offer is perfectly timed! I click, and landing on a new landing page inviting me to book my free course in exchange for a bit of information about me: First name, last name, phone number, etc. I hand it over willingly, and sign up. Of course, the marketing automation tool registers all this information. My profile is filling out, and my score is peaking. I’ve become a very hot prospect. The following Monday, I arrive for my first-ever Crossfit course. It’s painful, but the teacher is energetic, and the atmosphere is excellent. I’m a convert. After the course, Camille, a “host” at AdvisoFitness who knows EVERYTHING I did during my online journey, just has to overcome my final objection (it’s expensive!) by offering me a special deal for my initial membership. That does it; I sign. So yes, clearly this was an idealized version of events, and it’s easier to write it than to do it. Yes, it takes a lot of work to put such a complete strategy in place. But it’s totally possible, and it doesn’t require an enormous budget. 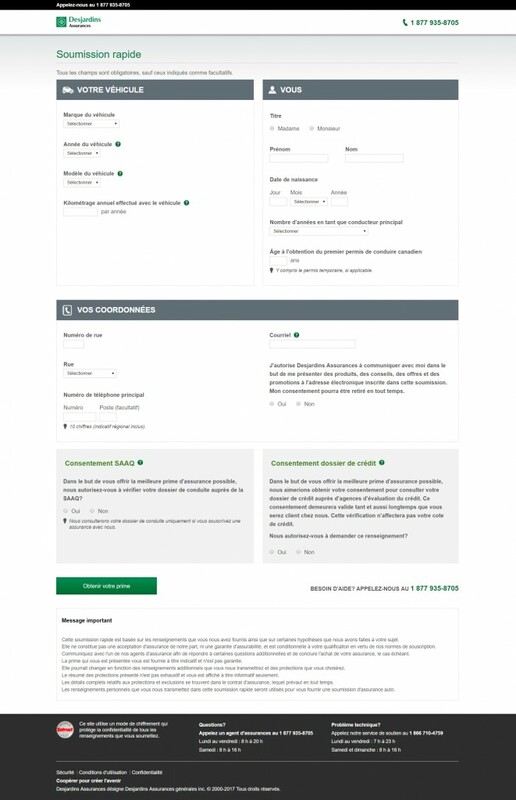 And above all, this little simplified example serves to show the central place of landing pages in the identification of users over the course of their customer journey, so we can then use tools to segment them, better personalize our communications, and qualify them more specifically. The ultimate goal being to increase conversions, and therefore sales. Once you see all the benefits these simple pages can bring, it seems a shame to miss out, no? Robin's role bring him to optimize his clients' digital assets (website, banners, landing pages, emails, etc. ), while supporting them in the implementation of tools that facilitate optimization. Methodical and disciplined, it is with precise attention that he ensures that projects are completed with success.